Watch this cooking video to see how to easily make Candy Apples at home! Why wait for the state fair when you have this charming Candy Apples recipe? Wash apples, then dry completely. (Note: In order for the sugar syrup to stick to the apples, the apples need to be well chilled before washing, drying and dipping in the syrup.) 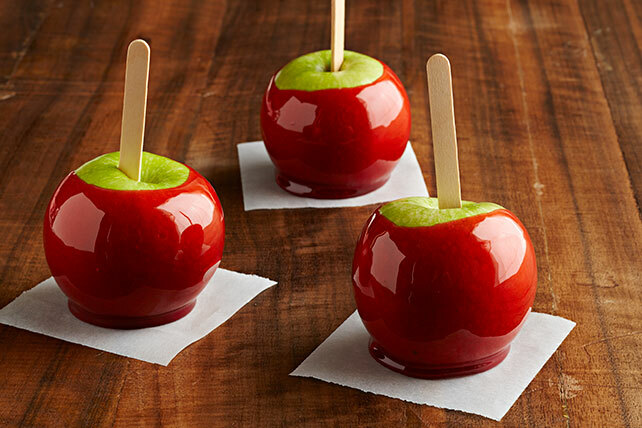 Insert wooden pop stick into stem end of each apple. Cover baking sheet with parchment; spray with cooking spray. Bring sugar and water to full rolling boil in medium saucepan on medium-high heat. Cook 8 to 9 min. or until syrup registers 238ºF on candy thermometer. Remove from heat. Immediately whisk in dry drink mix until blended. Dip apples, 1 at a time, into sugar syrup, turning to evenly coat each apple. Hold apple over pan to allow excess syrup to drip off. Place apples, 2 inches apart, on prepared baking sheet. Let stand 10 min. or until firm. Serve immediately or refrigerate up to 2 days before serving. Prepare using your favorite flavor of KOOL-AID Unsweetened Drink Mix. Immediately soak all cooking equipment in warm soapy water for 5 min. to help make cleanup easier.